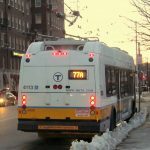 The Boston Business Journal recently reported on a new study of the Greater Boston area’s transit system, which finds the system lacks a “broader vision.” The study, conducted by the Urban Land Institute, was requested by Congressman Seth Moulton, who has been a long time supporter of a tunnel linking the North and South stations. Based on interviews with 75 regional experts, the study revealed that the rail link would have multiple benefits for the Boston area including reductions in commute times, an improved housing market, and potential development of valuable land surrounding Widett Circle and South Station. The report did not specifically recommend investing in the North South Rail Link, however it suggested changes to the current expansion of South Station “to ensure a substantial real estate component is considered as a complement to a future NSRL.” The study’s authors also expressed doubts in the current infrastructure’s ability to support current and future transit needs in the Greater Boston area. This study comes just months before the anticipated release of data from a current study being conducted on the potential North South Rail Link by consulting firm, Arup Group, and follows the August release of data from study conducted by Harvard School of Business. Critics of the study by Arup Group say it is biased and that the research is not dedicating enough of the budget to analyzing the multitude of benefits of a tunnel linking the stations.